The late 18th century Kingsland Homestead stands in a small park in Flushing, in tire shade of the landmark Weeping Beech tree, planted in 1847. 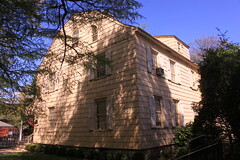 It is the headquarters of the Queens Historical Society. The first floor is used for exhibits depicting Queens history, drawing on the collection of the Queens Historical Society and community resources. A second floor parlor is decorated as if it belonged to a middle-class Victorian family. In an ever-changing borough that continues to undergo widespread development, the Queens Historical Society researches, records and showcases issues that have had a profound impact on the history of Queens.